Congratulations to Ron Smith (right here in Chicago ... and curator / proprietor of the OldiesMusic.com website ... so he knows of what he speaks!) He is our grand prize winner in the Joel Whitburn / Forgotten Hits 1950's Trivia Challenge Contest. As such, he wins a copy of Joel's new book "Billboard Best Sellers and Hot 100 Charts of the 1950's. And don't miss THIS one ... for the first time, Joel will be publishing The Cash Box Charts (this is the one that I'VE been waiting for!!!) Pre-Orders are being accepted right now with an expected ship date of February of next year. This book will complete The Pop Music Trilogy of Chart Research for the Rock Era ... Joel's Billboard and Record World chart books are considered the music industry bibles so you'll be sure to want to complete your collection! Wow, Kent, that was fun, "educational" -- and verrrrry hard.Below is my best shot at the answers.Thanks to both you and Joel for such a tough but engaging "assignment. "And congratulations on starting your 15th year. Kent, my attempt is attached. Lots of frustration with this one, but also lots of fun. It took some doing, but I've got 50 answers. Whether or not they are all correct, is a different story. I gotta tell you though, if I would put this much effort into other aspects of my life, as I did this quiz, I'd be in good shape. Here's my entry for the Whitburn '50s quiz (think I nailed them all). Wow, this was so,much fun! I submitted a guess for every question. Admittedly a few were "educated guesses" because I don't have access to the Billboard charts from the 50s. So, yes, for me this was a BIG challenge! I do have access to the Cash Box charts so most of my "educated guesses" were based on those. I'm hoping the charts were close enough to enable me to make most of my guesses correct. If I win I will provide my snail mail address. (I feel that to do so now would be presumptuous and might bring me bad luck)! Thanks to you and Joel for this! Okay ... here's my contest entry. 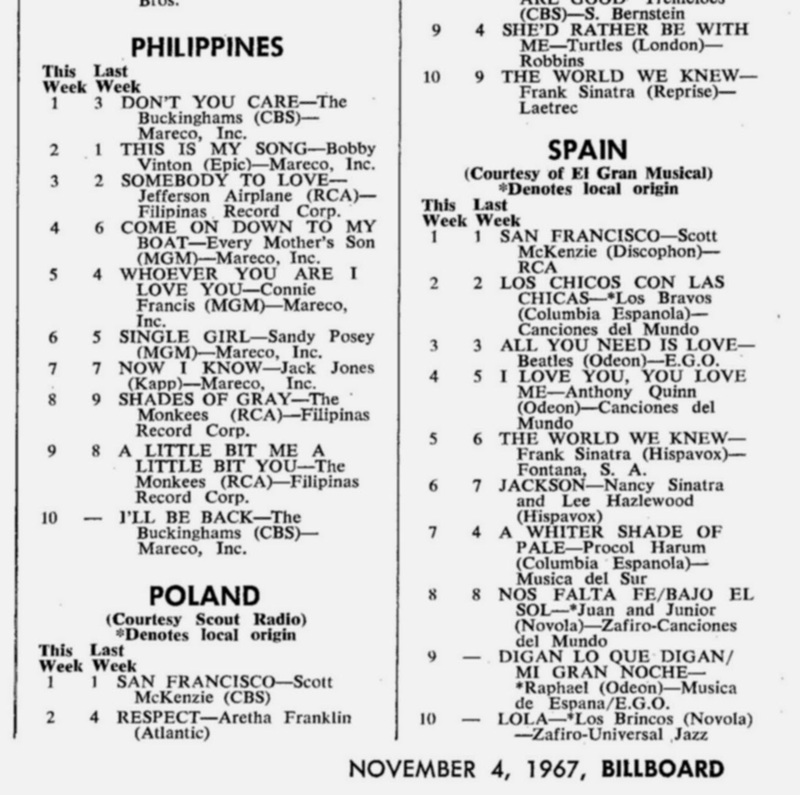 The Buckinghams were huge in the Philippines in 67 and 68. I thought I'd enclose just how big they were, and in particular, the Bucks' version of "I'll Be Back"!!! 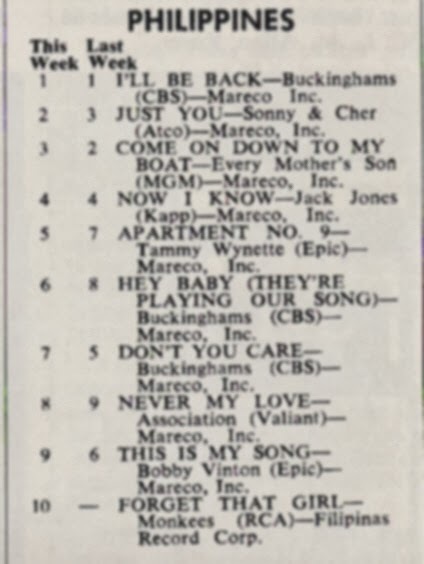 It debuted in their top 10 in Billboard's "Hits of the World" (Hey Joel Whitburn, how about doing a book on these?) 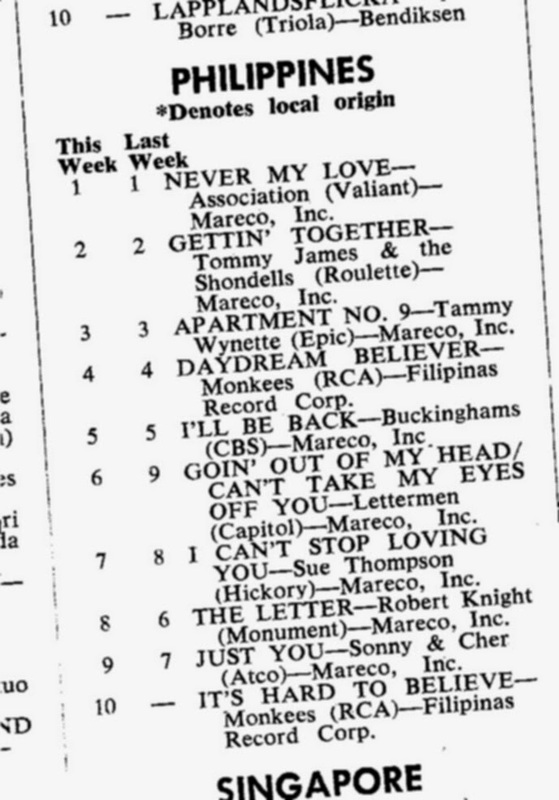 on 11/4/67 at #10 just as "Don't You Care" rose to #1. 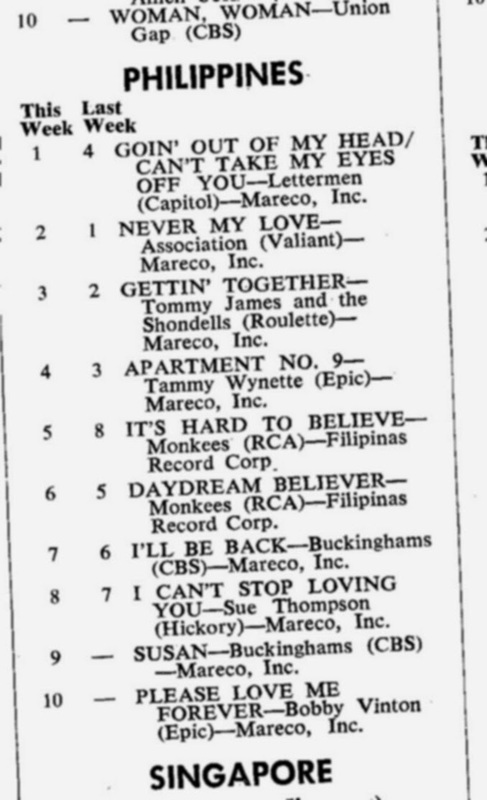 Obviously, from these charts, Monkeemania is in full swing, yet the Bucks really hold the top better in this country. 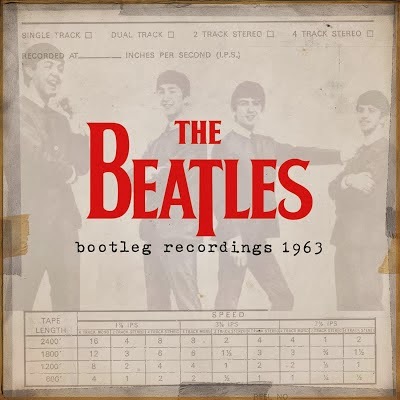 After a slow climb to #1, the Beatles cover finally reaches #1 at Christmastime, just as THREE Bucks 45s are in the top 10 now! Two weeks later, they hold 3 in the top 7! I think "I'll Be Back" held #1 for 9 weeks in a row, if I remember right. I did these jpegs years ago. 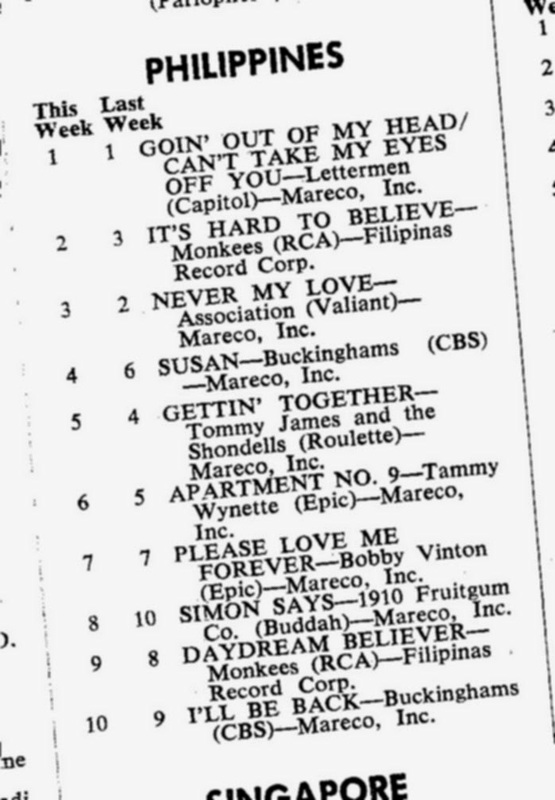 Finally, after 26 weeks in the Philippines top 10, it's last week was 4/27/68, while "Susan" is moving up! That's NOT half a year in the Philippines Top 100, but 26 weeks in the TOP 10!!! 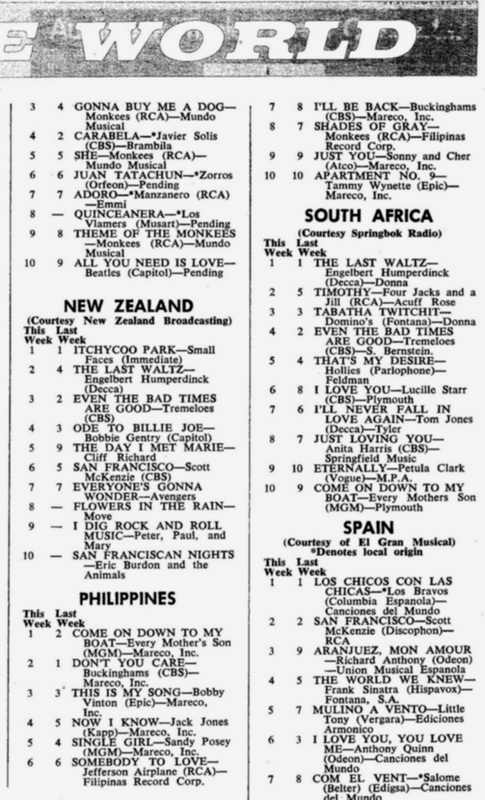 How do you sell that many 45s in a country of 7100 islands totaling (in 1967) 32 million people (3.1 in Manilla)? That's what I call blanketing a country!! I was reading the Newsletter today,and there was a letter about Stephen Caldwell and The Orlons. Stephen and The Orlons are doing well, playing shows pretty consistently. I've seen a lot of Steve over the past few months. He was backstage at our show in Collingswood with Dennis Tufano, Mark Lindsay, Ron Dante and Lou Christie. I thought I would attach a poster for an upcoming show we are doing with The Orlons! Maybe some of the FH Readers will make a road trip to attend. It's gonna be a blast!! And, I no sooner opened Mitch's email than I received this one from FH Reader (and dee jay) Gerri Bender! 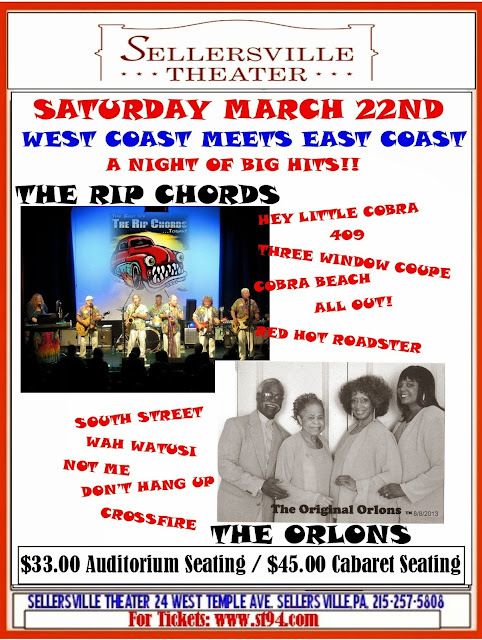 I am sure that Mitch Schecter has let you know that The Rip Chords and The Orlons (with Stephen Caldwell) will be performing a show at the Sellersville Theatre, in Sellersville, PA, on Saturday, March 22, 2014. Tickets went on sale December 10th! Had to chime in as it was your "introduction" of Mitch and I several years ago (when I won three Mitch Schecter solo Cds, that are awesome, by the way) that has led to a beautiful friendship! Happy Holidays to you and the family! Keep up the good work! Thanks for including me in the mix. I see some of my “old” and current friend’s names and their comments here. Your research is stellar ... if awards for the best info on the music of the 50’s are ever awarded, you’ll be in the limelight. P.S. BTW, the first 45 I purchased was “Rockin’ Robin” by Bobby Day. We had a 20 record Seeburg Jukebox in the basement of our home and stacks of 78’s. Thanks, George ... I think you're gonna like it here. The Beatles are all over the news again this week ... for any variety of reasons. As mentioned the other day in FH, it's all part of clearing the decks in order to protect expiring copyrights due to a change in the laws that would allow this material (unreleased or not) to fall into public domain. As such, we're going to get a wave of material that was never considered good enough to release before ... but now suddenly is! (I will admit that there WAS a time in my life when it was important for me to own ... or at least hear ... ever note The Beatles ever put down in the recording studio ... but I've thankfully passed that stage now ... and quite honestly am I little bit surprised that The Beatles themselves would be supportive of this release as they ALWAYS prided themselves on only putting their best effort forward, locking away everything else that got them there in the vault. I suppose after the release ... and success ... of the Anthology series ... three double CD sets that did big business several years ago ... followed by the success of their two sets of BBC Sessions ... as well as the complete re-release of their entire music catalog with enhanced sound ... they've come to realize that the public will buy virtually ANYTHING "new" by The Fab Four that they haven't heard or had access to before!) For MY money, I don't need to hear six takes of "Misery", a best forgotten early track from their first British LP in 1963 ... the only final take is good enough for me. You've probably already heard about the signed $1.00 bill with all four Beatles' signatures on it that failed to reach its minimum bid reserve on eBay a couple of weeks ago. Then, it finally found a buyer ... but the sale fell through ... so it reportedly went back up on the auction block again ... and ultimately sold for just over $25,000!!! It's a very rare piece of Beatles memorabilia in that it was signed BEFORE Beatlemania hit here in The States, just prior to The Beatles' first appearance on The Ed Sullivan Show. File under: Now THAT'S Annoying!!! I guess it's a Good News / Bad News scenario. Oddly enough, this will not be a COMPLETE collection ... albums that had the same track line-up will not be re-released in conjunction with this new set (meaning albums like "Sgt. Pepper", "The White Album", "Yellow Submarine", "Magical Mystery Tour", "Abbey Road" and "Let It Be" will NOT be part of this new collection.) 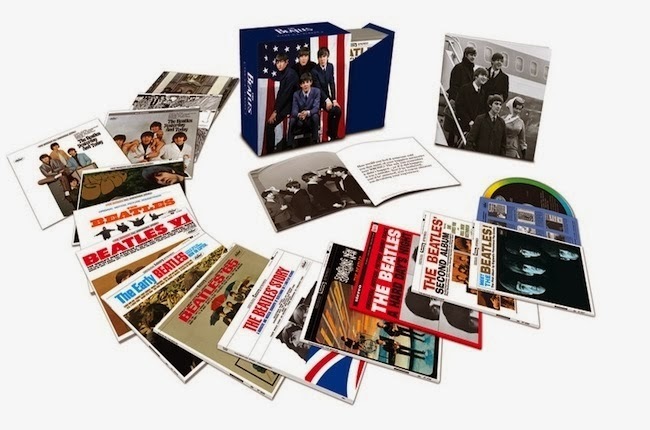 On the plus side, I can FINALLY add "Hey Jude", "Yesterday And Today" and the "A Hard Day's Night" soundtrack back into my collection. On February 7, 1964, The Beatles touched down on U.S. soil for the first time. This coming February, New York and the NYC BEATLES 50 Committee will be hosting several celebratory events and gala concerts across the city, with proceeds benefiting Food Bank For New York City. Special events highlighting NYC BEATLES 50 will include a star-studded concert at the Apollo Theater in Harlem, the gala, ‘America Celebrates the Beatles All-Star Concert’ and more. Additionally, there are all-day lineups of bands planned on Saturday and Sunday, February 8-9 throughout the city. The 50th Anniversary Celebration highlights the number 50 throughout the series of events, with 50 bands from 50 countries having been invited to perform in New York City, and most tickets will be priced at only $50 each. This city-wide, globally-inclusive series of events and shows to celebrate the 50th anniversary of The Beatles visit to the United States is still adding artists, celebrity presenters and panelists. For more information or to inquire about participating as a musical artist or sponsor, please contact Kathryn Musilek: km@sharkpartymedia.com. Stay tuned for updates, artist lineup and additions to come. Tickets will go on sale shortly to coincide with the launch of the website www.NYCBeatles50.com. Food Bank For New York City recognizes 30 years as the city’s major hunger-relief organization working to end food poverty throughout the five boroughs. As the city’s hub for integrated food poverty assistance, Food Bank tackles the hunger issue on three fronts — food distribution, income support and nutrition education — all strategically guided by its research. Through its network of community-based member programs citywide, Food Bank helps provide 400,000 free meals a day for New Yorkers in need. Food Bank’s hands-on nutrition education program in the public schools reaches thousands of children, teens and adults. Income support services including food stamps, free tax assistance for the working poor and the Earned Income Tax Credit put millions of dollars back in the pockets of low-income New Yorkers, helping them to achieve greater dignity and independence. Learn how you can help at foodbanknyc.org. And, let's face it, you can't talk about The Beatles ... and New York City ... without mentioning John Lennon ... who called New York his home for the last years of his life. Lennon was recently honored with a star on the Hollywood Walk Of Fame. The ceremony coincided with the anniversary of his murder, incredibly 33 years ago. John Lennon was remembered in a moving tribute at his star at the Hollywood Walk of Fame Sunday, December 8, 2013, on the 33rd anniversary of his death. Many fans gathered at the celebration, organized by peace activist Jerry Rubin and Breakfast With the Beatles radio show host Chris Carter to commemorate John and pay homage to his music and his life. Pat Tyson has sent us her report of the event and pictures for our readers. Click here: John Lennon honored at Hollywood Walk of Fame star on 33rd anniversary of death - National john lennon | Examiner. HEART, Yoko Ono, Jackson Browne, Melissa Etheridge, Nils Lofgren, Little Steven and Indigo Girls are just a few of the many artists who have come together to lend a helping hand to Tunes4Food - Redemption Day, a newly released CD on Popadelic Records that will benefit three Feeding America Food Banks: Food Bank of Western New York in Buffalo, Cleveland Food Bank and Long Island Cares/The Harry Chapin Food Bank in Hauppauge, New York. Available now on iTunes for $9.99 (https://itunes.apple.com/us/album/tunes4food-redemption-day/id766096950?ign-mpt=uo%3D4) and eBay (in packs of 2, 3 or 10 ranging from $25 - $100 that all include free shipping and promo stickers), Tunes4Food - Redemption Day features nineteen tracks in all (see below for track listing). Trying to answer the question, "What would John Lennon do to help feed the needy?," Bob James and a group of music students in Buffalo, New York came up with the idea for Tunes4Food and quickly organized a continuous 25-hour benefit concert on the steps of City Hall (June 2009). "Distinct from crisis-driven benefits, this is a proactive campaign to address the growing need for help not only in these particular communities, but across our country," says campaign manager and project producer James. "Unfortunately, hunger is a growing epidemic but, with this drive, I think we can make a measurable difference." 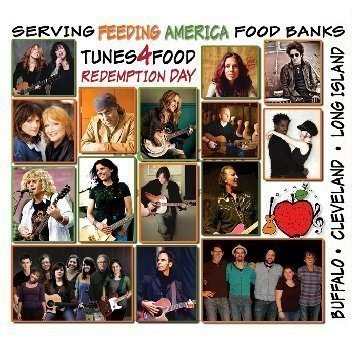 It's been determined that for every Tunes4Food - Redemption Day CD sold, the Feeding America Food Banks can purchase approximately 40 meals. "It's amazing that a small grassroots community service music club in a Buffalo classroom has drawn together some of the biggest names in music," comments Bob James, who was recognized by Hillary Rodham Clinton in 1999 for a music campaign relating to school safety in the Buffalo area. "We have deep appreciation for the artists and their staff that helped build this album. We hope that the meals generated to feed those in need will be received in that spirit and we challenge musicians in other communities to adopt this idea." As stated by Feeding America, "Hunger exists everywhere in America. It does not matter if you live in a urban, suburban or rural setting - hunger has no boundaries." "Given the abundant planet we live on, there should be no hungry people anywhere, including America. Please support this worthy cause however you can. We can all help and solution are our collective responsibility." You still have until 10 pm Chicago time tomorrow night to get your entries in. We'll announce the winner on Sunday ... and run the complete set of answers early next week. Meanwhile, get your entry in before tomorrow's deadline for YOUR chance to win a copy of this great new book! I'm trying to decide if this was a cruel trick or an early Christmas present! Oh my! The synapses are burning now! What a cruel trick to offer a super 50's trivia contest at the busiest time of the year! What a terrific marketing ploy to help Joel sell his super book! I browsed through the questions ... what a devious mind he has! How wonderful to rekindle joyous memories from our innocent youth. I have put off doing the quiz until a quieter time after Christmas ... (then I can use his book as a reference!) and take pleasure in the discovering the answers and learning other aspects and secrets of the great era the fifties were. Merry Christmas to you and to all the FH readers, supporters, and contributors! And to all my friends from "Music Oldies" who enjoy this wonderful chronicle of our unequaled journey towards adulthood. In your column today about the soundtrack album from MARY POPPINS being nominated for the Grammy Hall of Fame, I agree with you that it is somewhat hard to believe. When I first read that, I thought immediately of the New Christy Minstrels' tune out of 1965 CHIM CHIM CHEREE which was played on local top 40 radio stations. The reason I remember it real well as that one of our local DJ's would turn the record over and play the flip side, THEY GOTTA QUIT KICKIN' MY DOG AROUND. Always liked that tune over the "A" side of the record. 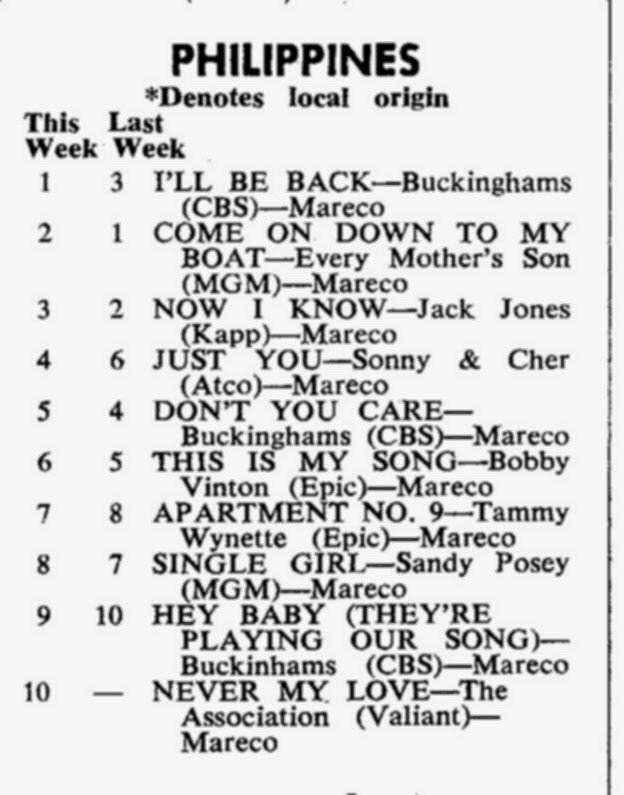 I think people tend to forget just how big the "Mary Poppins" soundtrack really was back in '65. It held down the #1 Spot on Billboard's Albums Chart for fourteen weeks, the longest stretch of the entire year, holding even The Beatles at bay during some of that time. Always interested in Kenny Rogers and the First Edition. I did not know about Thelma or Mary back then. When I heard them on the radio, I did not know a woman was in the group. Nice to know it now! >>>I came across your website while searching for an old song that my father used to play many years ago. I believe the song was produced in the 1960 - 1970 era. I am desperate to find this song, I have searched for the lyrics and everything I can possibly think of to find the song and keep coming up empty. I wasn't there myself, but I saw the film. I'm gonna see a man about a Ford GT, and as the song fades you hear " Turn It On, Turn It On, GT Ford" sang over and over by the backup group. HIT RECORDS HAD A TON OF COOL MUSIC BY "WHO REALLY KNOWS WHO THEY WERE" IN REALITY. Meanwhile, I think we made Melinda's day ... and right before the holidays, too!!! That's so amazing! Thank you so much, he is going to be so excited! And now maybe we can help HIM out as well ... see his note below! I wish some one could tell me the song that came out in the late 70's early 80's era that sounded like the style of Jigsaw... "Sky High" and Pilot ...."Magic" that said in it's lyrics ..."You're a bag of blivet!" My sister remembered it from the radio station WROQ in Charlotte NC but it stumps me to give her the answer. The only song that has ever stumped me in a question. You had a reader ask this week who was the woman dancing with the late Davy Jones during last weekend’s PBS-TV 60s special. That was Davy’s third wife, Jessica Pacheco. I was watching the My Music last night on PBS and was wondering if you knew who the backup singers were singing behind Davy Jones? They were four black men all dressed in the same suits and then there was also a girl playing tambourine and a guy playing guitar as well. I thought they were wonderful as well as Davy. Thanks so much for the info. I love these specials. Billy J. Kramer and I are spearheading a project to get Brian Epstein nominated and inducted into the Rock and Roll Hall of Fame. I can't believe he's been overlooked all these years! I'll give you details as we progress. We sure could use the support of all your readers. I'll keep you posted, ol' buddy. A valiant effort, to be sure ... but, unfortunately, a waste of time ... the folks running The Rock And Roll Hall Of Fame truly couldn't care less about what we music fans or the artists think ... they have their own agenda and don't respond to any outside suggestions. (For that matter why isn't Ed Sullivan in The Rock And Roll Hall Of Fame?!?! He brought this music to MILLIONS every single week ... and introduced us to all the latest sounds for over twenty years!) I've seen petitions signed by over 10,000 people that went absolutely nowhere. I have a question for Joel Whitburn, if you don't mind. It's about the Orlons, a Philadelphia group, made up of three ladies and one man. 1962 to 1964 were their best years. My Billboard book and Norm N. Nite's book say that Shirley Brickley was lead singer. Other internet sources say that Rosetta Hightower was lead singer for most of their hits. I'd like to know which one is correct. Whitburn's book says that Rosetta Hightower sang the leads ... and tells us that Shirley Brickley was shot to death in 1977 ... so technically we already HAVE his answer. Steve Caldwell (the "one man" mentioned in your email) has participated with Forgotten Hits a few times over the years ... maybe he can provide some additional insight into your question. Jeff Tamarkin tells us that it was Steve Caldwell who first handled the leads! Then, when the label execs that this wasn't quite the sound they were looking for, they told The Orlons "that each of the girls would be asked to sing lead the next time the group came in" to the studio to record. Their first single for Cameo was the standard "I'll Be True" ... and on THIS record, the lead vocal was handled by Marlena Davis (the only girl you DIDN'T mention in your email!) This record failed to chart so on the follow-up single ("Mr. Twenty-One") the lead vocal went to Shirley Brickley. It wasn't until their third release that The Orlons broke through on the charts ... "The Wah-Watusi" went all the way to #2 ... and Rosetta Hightower was "now installed as The Orlons' primary lead vocalist." Tamarkin says that Steve Caldwell's rich baritone came into his own "as an essential component of the group's vocal mix ... The Orlons had stumbled upon a recognizable sound." For their next hit ("Don't Hang Up" ... another Top Five smash) Caldwell used what came to be known as his "frog voice" ... listen to the "No No" next time and see if you agree! I'm up listening to the Nick Digilio Show on WGN on-line. He just had an interview with Denny Tedesco. He was promoting the fund raiser for "The Wrecking Crew" ... It was a good interview.